Bells not only sent forth the clarion call of faith, they also projected power into the countryside. 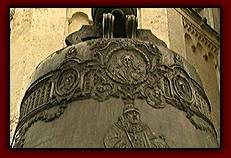 The Tsar himself is depicted on this, the worlds largest bell, here at the very center of power inside the Kremlin. 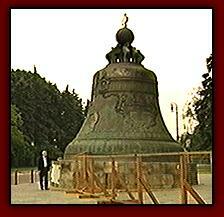 No one ever heard the sound of this bell because it was too heavy to be hung. It cracked when water was poured over it prematurely breaking off a piece which itself weighed 25 thousand pounds.